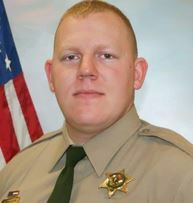 (Newser) – The Cowlitz County Sheriff's Office in southwest Washington state is mourning Justin DeRosier, who is believed to be the first deputy killed in the line of duty in the agency's 165-year history. Sheriff Brad Thurman says the 29-year-old deputy was fatally shot Saturday while responding to a report of a disabled vehicle blocking a rural road near Kalama, CNN reports. DeRosier was able to report to other deputies that he had been shot, but he died of his injuries soon after he was taken to a hospital in Vancouver, Wash. After a 22-hour manhunt, the suspected gunman was shot dead Sunday night, Longview Daily News reports. Thurman says the gunman was shot by two officers after emerging from woods carrying a firearm. It's not clear whether the gunman fired first. And how many people have been shot by officials of this department in this 100 plus years????? And what of their families and sons and daughters??? Sad all the way around.
" the suspected gunman was shot dead Sunday night, " Of course he was. Cop justice baby. Lets hope it was the right guy.